Safety on site, PPE and Industry Best Practice Felling, takedown, snedding and crosscutting techniques, and presentation of produce for trees up to 2 times guidebar length and not greater than 760mm in diameter. 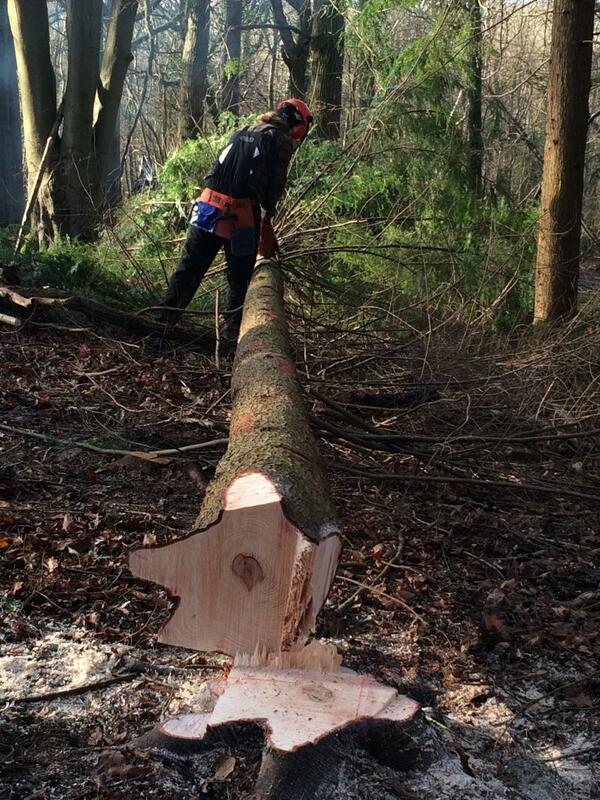 Use of felling and timber handling aid tools. Identify the risk assessment and emergency procedures on a worksite. Assess the trees to be felled for hazards and risks. Fell trees that have a diameter greater than the effective cutting length of the guidebar, but not twice the guidebar length. Guidebar length not greater than 380mm/15”. Assess a leaning tree and the safest method of felling. Make accurate felling cuts in the correct positions. Delimb felled trees in a safe and methodical manner. Crosscut timber accurately to required lengths. Assess and explain the term ‘tension’ and ‘compression’ in timber. Assess a hung-up tree and the safest method of takedown. Select and prepare equipment required for safe and effective takedown and check on the safety of takedown tools including hand winches. Make accurate severing cuts in the correct positions. Select and use hand tools safely. Units 201, 202, 203 (CS 30 and 31) Some experience of winching would be an advantage. Excellent practical demonstrations with new felling techniques taught. Educational & fun, well organised. Working forestry site with actual objectives. Positive attitudes & teamwork. I enjoyed the course a lot. There wasn't a huge amount of time spent on paperwork - we just got on with the felling and processing straight away. The advantages of integrated assessment! I know feel that I have a good understanding of the problems involved and ways to overcome those problems. We have a full range of hire PPE (Person Protective Equipment), Chainsaws, maintenance tools and small felling tools if required, and links with local suppliers to help you get the right kit at the best price. Please let us know at the time of booking, if you would like to hire any kit.